Good Afternoon Parents! It's Me, a 90s Baby. The one whose parents would let her hang outside with her friends without being hovered over. The one who would attend parties with the family and didn't have a parent continuously checking up on whether or not we were having fun or what we were up to. The Kid who couldn't rely on phone apps or tablets because they didn't exist. The one who had to think up our own crafts, games, or whatever we wanted to do at the moment... I'm also the one who has a 4.5-year-old in the year 2017 where the news is constantly scaring me. Some of the most controversial topics surrounding play are whether to include a recess at school, whether or not kids should play unsupervised, Should we allow screen time, and if sports count as play. Genius Of Play created a great video that shows parents each giving their opinion on such topics and it's great to watch. 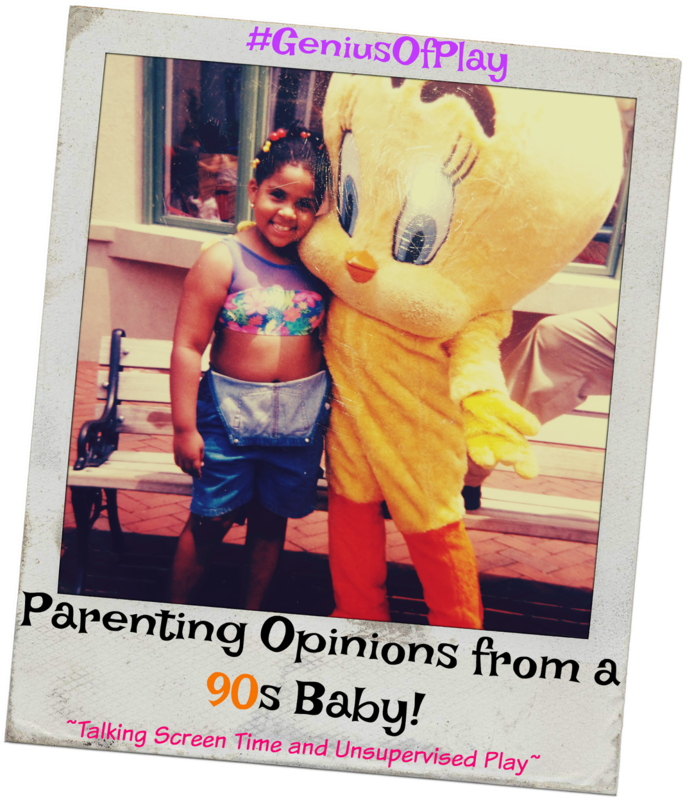 In my post, I decided to talk about Unsupervised Play and Screen Time. Let's start with unsupervised play. When I was a kid, our parents trusted us. We were allowed to go to the store alone, Play outside for HOURS alone until they popped their heads out the window and yelled our names, and even hang in other kids houses (no matter the gender) because they knew we weren't thinking about anything but playing with their toys. Back then, we acted our age. These days, 11-year-olds have attitudes and swear they're 21. I would LOVE to allow my child to have unsupervised play, but I see too many kidnappings and traveling bullets happening on a Daily Basis. These are things that scare me, but what scares my kid? NOTHING. My kid has no idea what's going on in the world. All she knows is that she's a kid and she wants to play without me saying "Gabby Don't do that! Gabby, Stop. Gabby, Play Nice!" When My kid gets older, then maybe I'll allow her to have the same unsupervised play I had as a kid. Mostly, because it is my greatest childhood memory and It should be hers too. There are TONS of ridiculous shows and clips on tablets that have us thinking "why is my kid watching this?" The answer is always "I don't know" or "because I like it". Then there are also MANY educational videos within the same app which takes away the guilt of letting our kids be on their devices. Though we didn't have tablets when we were younger, it would've been great to have videos that showed me how to make Slime or how to build Popsicle houses! That right there shows that it can promote play. It may be a step by step instruction to make something, but it brings on imaginative play. My niece made a bunch of slimes which my daughter then used to cover her plastic toys like a monster. My niece made a popsicle house because she saw a video and made it her own. I used a video to make adorable fairy dolls for my daughter to play with! With all that said, What's your opinion on these topics? Would you let your child have Unsupervised play? Will you allow them to have all their Screen Time? Disclosure: This is a sponsored post in collaboration with Genius of Play. However, all opinions are completely my own. Unsupervised play and screen time has different parameters for everyone. We live in a quiet suburb where unsupervised play at the lake is the norm until the moonlight comes. As for screens, I truly believe everything is good in moderation! I grew up in a very safe area had unsupervised play, but in this day and age, I just can't do it. My oldest is going to be 12 at the end of next month and while we do give him some freedom, I'm terrified to just let him walk to the park with a friend. My husband is more easygoing about it than I am, so I am trying to relax a little -- but it's hard. We limit screentime because I see how my kids act with too much of it. However, I added Ebooks this weekend and gave my oldest his tablet back. My middle kid (my daughter) is able to handle screentime just fine, but her two brothers will stay on forever if I don't regulate it. However, if they are only reading ebooks, that I am okay with. So, my point? We know our kids and we have to decide what we think they can handle. What's right for one parent and kid may not be right for another family. We talk about this all the time. We used to run the neighborhood and come back when the street lights come one. Can't do that anymore but I would love to. Growing up we were literally out from sunup to sundown and rarely did my parents worry about us. However, times have changed and I now have 5 kids of my own to protect but I am not a helicopter parent. My kids play outside in my community by themselves (the older ones are 13, 10 and 8) and my 4 year old will play outside with them and if they aren't around then I am out with them. My youngest is one so whenever he is outside so am I or my husband. I think it's based on maturity and responsibility on their parts as well. Screen time is harder because it is the generation in which we live. It's part of their growth and although I do limit the time, I think it's important as well. I think I was heavily influenced on how I was raised because when I brought up my kid we made a family decision not to have TV/cable (until now we don't have this), not allow her to be in social media until her last 2 years in high school, etc. Some say we were too strict, but I was glad we did it this way. 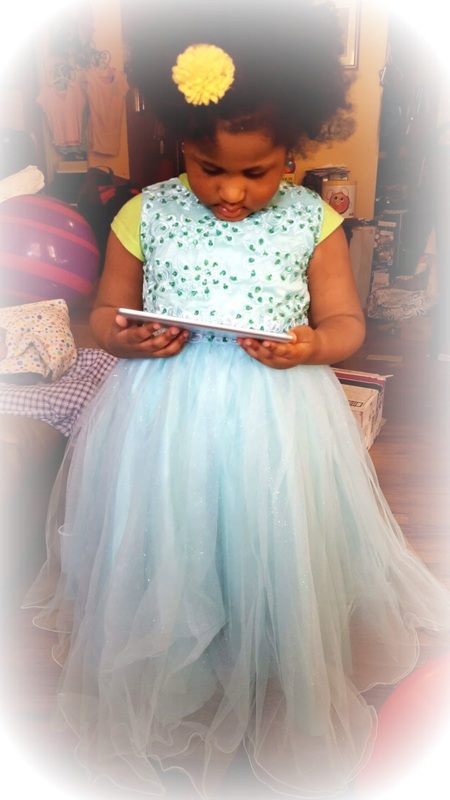 It is almost raising her the traditional way despite all the advent of technology around her. I don't habe a child, but I do get your point. I remember playing outside and not being scared about whwt can happen. These days, we're living in a different world, one that's not completely safe anymore. I think allowing kids to use technology is great. It's part of their time and it's part of their future, so why not, right? I really think it depends on the child. Some children can be left to their own devices and play without supervision, some can not. The same goes for screen time. I think you should monitor what they are using their screen time for and make sure it isn't the only thing they are doing. I am actually discussing this to my husband about the parenting style that we have once our baby will be born. One thing is for sure, I definitely want to limit my child on playing gadgets and electronic devices. Growing up I was definitely allowed to do all the same things that you mentioned. It is such a different time now and that makes me sad for the youth of today. These are two things that have changed so much from when I was a kid. We supervise screen time but would never let the kids play outside with out us.